I have to take an English Literature exam tomorrow. I feel my brain crammed with both useful and obsolete information, and can almost hear the random names and dates and works, spanning Beowulf to present day, that are falling out at the back of my head for lack of space. I need a break. I also kind of need to remind myself why I’m pushing myself to study and do well on this test. Why I’ve chosen this field of study in the first place. Technically, this is work: a bite-size sampler of my favorite author (as a certain person I know would put it: the number one, ichiban, best ever author of all time and for all worlds to come, for me): Edgar Allan Poe. When I say favorite author, I don’t mean the person who wrote my absolute favorite works. 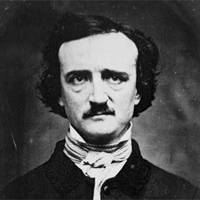 I mean an author whose work I consistently admire, whose (in the case of Poe) lyrical style I find mesmerizing. I didn’t have to learn to love Poe. For me, he wasn’t an acquired taste (like Shakespeare), or the producer of works whose skill I can perceive without my developing an emotional connection to them (like William Faulkner). His work crept relentlessly into my mind and imagination, and I sought him out without classroom instruction or parental guidance. I first (truly) encountered Poe as I sat in my 10th grade classroom. I was done with my writing assignment, bored to tears, and in a quiet desperation induced by the academic apathy of everyone around me, present daily during my high school days, without fail. I pulled out my American literature textbook; these books were among the best quality books we used at school, actually purchased from the USA, and costing a hefty sum (in American dollars) if anyone was careless and lost their copy. I flipped through the pages, skipping the scattered short stories of miscellaneous obscure authors which were the only things we had been assigned from the book. I browsed beyond, eyed unfamiliar stories, plays, and poems by unfamiliar authors I would only come to learn from much later on: works like Miller’s “The Crucible,” Rose’s “Twelve Angry Men,” T. S. Eliot’s “The Love Song of J. Alfred Prufrock.” I eyed unknowingly. Suddenly my eyes landed on the poem “The Raven.” I had heard of it before, but never had read it. I liked the photograph of a stone sculpted raven that accompanied it. I settled down to read it. I read the poem every day. I don’t know for how long (may the entire trimester), but all I knew was that I loved the sounds Poe’s words made in my head. I sat at my desk and let the now familiar words wash over me. I impatiently waved people away when startled classmates saw me fixedly staring at the book, and wondered, alarmed, whether there was an assignment due that day they had forgotten to do. I liked the poem, and took to quoting it in my head. The textbook had more surprises in store. Along with “The Raven,” it included one of Poe’s grislier stories, “The Pit and the Pendulum.” I was actually just as creeped out by the illustrations in the book as by the description of the exquisite torture the servants of the Inquisition devised for the narrator: white-hooded ghostlike priests, the labyrinth-like, shadowy, crumbling mass of the tower where those God-forsaken victims were kept. The story entranced me, and I knew I wanted much more Poe to read. Soon followed a trip to Florida, which for me meant joy, mostly, because it was synonymous with a trip (or many) to Barnes and Noble. I loved to read in English; alas, English classic books were not greatly available to a teenager in Caracas at the time, and I wasn’t allowed to order almost anything over Amazon.com (and delivery time could take 3 weeks or more, I might add). The selection was wonderful. Following an introduction by Neil Gaiman (another author I would only discover as an upperclassman! 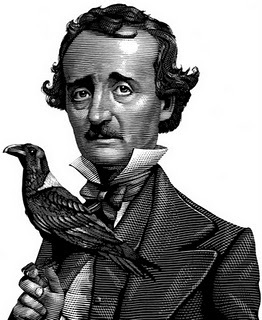 ), I was presented with some of Poe’s best poems and stories, accompanied by gorgeous, engraving-esque illustrations by Mark Summers. 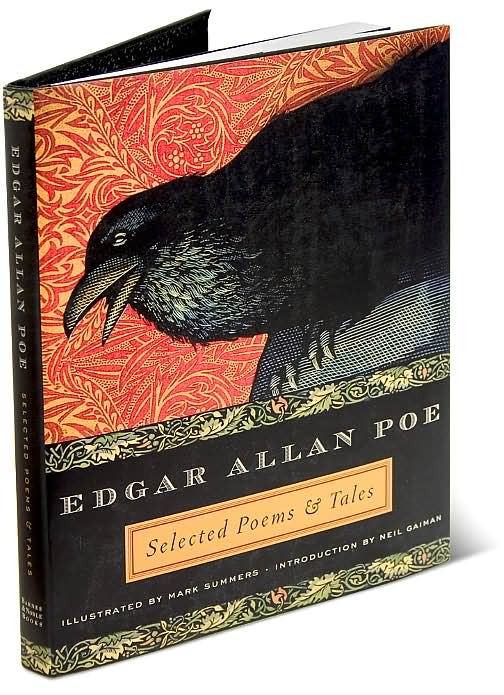 Other great poems include “The Bells,” “The Raven” (of course), and “Ulalume,” the latter of a particularly strange and otherworldly variety, even by Poe’s standards. I will make no further mention of what I feel is one of the most annoying poems known to man (maybe only annoying because of its ridiculous and, what I viscerally more than rationally feel, unwarranted popularity) than to say that yes, “Annabel Lee” is also in this collection. Perhaps it is the fate of all passionate readers to be frustrated by the fact that their favorite authors are inextricably linked (in the public’s mind) to inferior, yet inexplicably popular, works. The stories are wonderful. “Hop-frog” is ghastly, and was the first Poe story Neil Gaiman encountered, as he mentions in the Intro. I can’t determine whether “Berenice” is more horrifying in what you imagine will happen in the story, or in its actual resolution. “The Cask of Amontillado” is my favorite story-illustration pair in this book, with a figure dressed in motley, chained to a wall, reaching out both arms and emitting a silent howl of realization and despair I can imagine perfectly. “The Murders in The Rue Morgue” is a delightful mystery, claimed by some to be the world’s first detective story, with August Dupin solving a seemingly uncrackable case a good 46 years before the illustrious Sherlock Holmes ever graced the written page. “The Masque of the Read Death,” however, is my favorite short story, recounting the protective measures taken by a lighthearted prince in times of bubonic plague. The story’s last line is particularly memorable. This entry was posted in Literature and tagged Edgar Allan Poe, Mark Summers, The City in the Sea, The Raven. Bookmark the permalink. Didn’t know you read and re-read so many times within the course of a short time. It’s so great when things make such an impression on a person. I really have to re-read that poem! While searching online for answers to questions in the GRE Literature in English Practice book, I found this blog. I have to say that Poe is also one of my favorite authors. “The Raven” is an excellent work, although I will admit I’ve read it fewer times than you. Anyway, the real reason for this comment is that I would like to get in contact with you. I’m not sure how to send personal messages on WordPress. I sort of abandoned my blog when I wasn’t generating traffic. Now I’m wrapped up in studying for the aforementioned test. I think we would both enjoy and benefit from online conversation. Please email me at andrew.r.maxcy@gmail.com. I hope you did well on the test!